The project team (left to right): A. Mazel, P. Lewis, P, Warke, M, Giesen, R. Enlander. The Heritage and Science: Working Together in the CARE of Rock Art project completed its third and final data collection exercise in early September. The team included Dr Aron Mazel, Dr Myra Giesen and Peter Lewis from Newcastle University with Dr Patricia Warke and Dr Rebecca Enlander from Queen’s University Belfast. 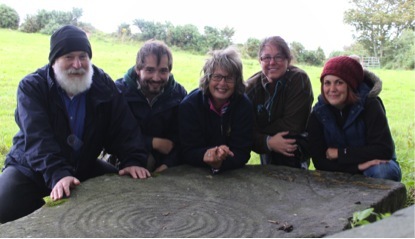 The team visited several rock art sites in Donegal, Ireland, to gather further scientific data on the contributing factors to rock art decay. 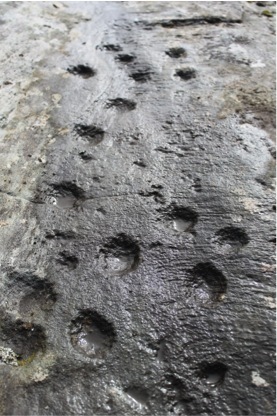 Twenty four panels were analysed in a variety of conditions, some almost perfect but others were very eroded. This was very helpful in providing a variety of data that can be used to analyse the factors affecting rock art condition. Despite very high concentrations of rock art, especially in an area called Doagh Island, all the sites were on private land and not signposted or easily accessible. Example of rock art in an excellent condition. As usual soil samples were taken at each site but unfortunately, and not for the first time, the XRF machine broke down so it was impossible to analyse the rock composition. This will now be done at a later date. The findings, along with the written recordings of risk factors at the panels, will help to further shape the tool kit and management guide that aim to help protect rock art. With the data collected for the Donegal sites, the fieldwork element of the project is now complete. The next phase of the project will focus on continuing with consultations over the toolkit and management guide with a view to disseminating the final products in January 2014. To join a wider discussion about rock art and rock art sites visit the Rock Art of the UK and Ireland page on Facebook. This entry was posted in Current Research and tagged archaeology, conservation, cultural heritage, current research, rock art, science. Bookmark the permalink.